The first three lectures for the 2016-17 season have been announced on the AVAS website. Follow this link to the Meetings page for details. The talks represent an eclectic mix of subjects and geographical regions, from the Maya of Central America to Stoney Cross Airfield a little closer to home. Also, Professor Tony King will be talking about a fascinating Roman find at Meonstoke. We will be announcing more talks shortly. Visitors are very welcome. Last weekend a group of AVAS members undertook their first gradiometer survey using equipment borrowed from Bournemouth University. 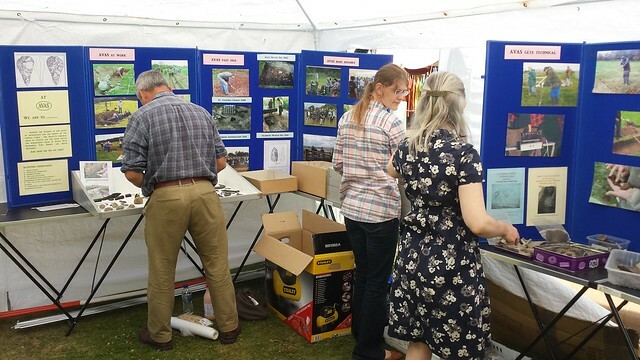 The equipment is being lent out to local archaeological groups as part of a project called LoCATE (Local Community Archaeological Training and Equipment), which is a partnership between the Archaeology Department at Bournemouth University and the New Forest National Park Authority. The site was between Salisbury and Ringwood in the Avon Valley. The field in question contains a distinct ploughed out mound about 60m long in a field now used for pasture. 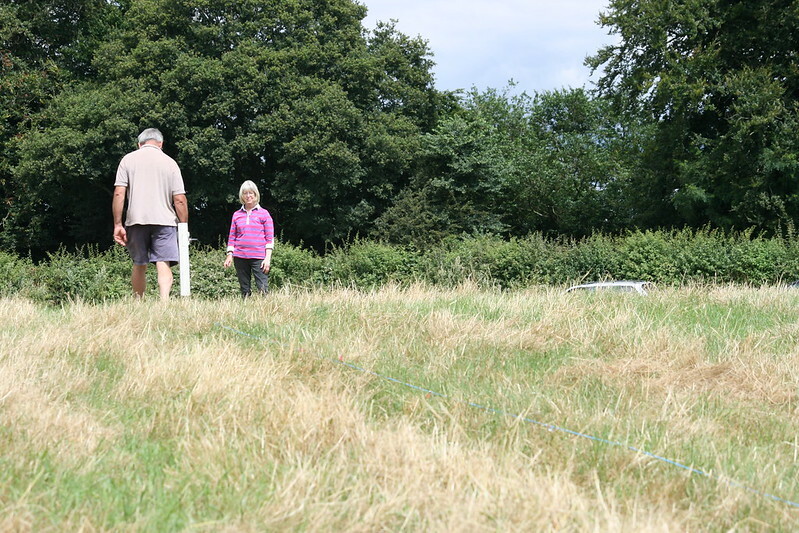 We did a resistivity survey here in 2011, which picked out the shape of a regular long mound, but failed to locate any possible ditches; the jury was out on whether this was a long barrow. 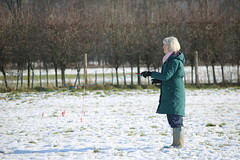 After locating the fence posts used as survey points for our 2011 resistivity survey, we soon had our grid squares set out. It took a little while to calibrate the gradiometer, but we were quickly able to complete a couple of squares. We took a break to download the results. The bright sunshine meant it was difficult to see the laptop screen, but we could make out a couple of distinct lines which appeared to respect the mound. It looked like we might be picking up two ditches. Mark and Jan undertaking the survey. This photo also shows the mound, which is hiding the car to the right. We were able to rapidly survey another four squares, with a short break for lunch. I had downloaded the results for the first four squares, and the results looked promising, but again it was hard to see on the laptop. 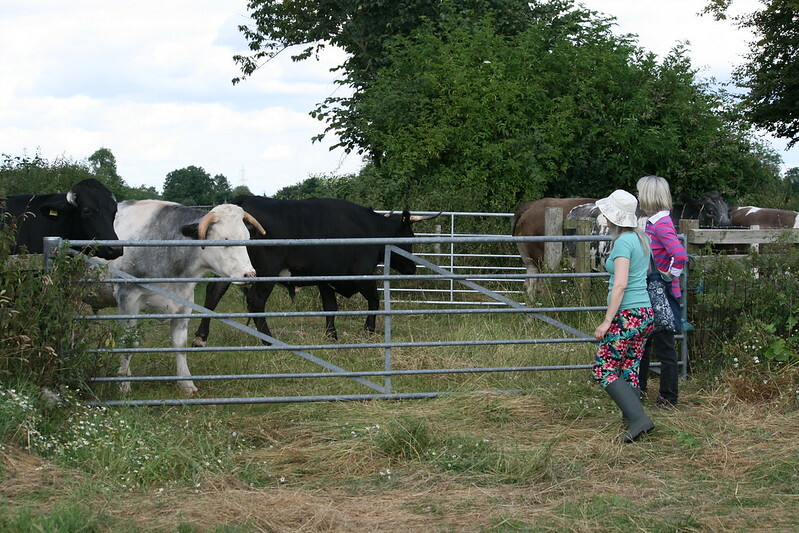 On trying to exit the field, our way was blocked by an angry herd of bulls, but Rachel was braver than me and jumped over the gate to encourage them out of the way. 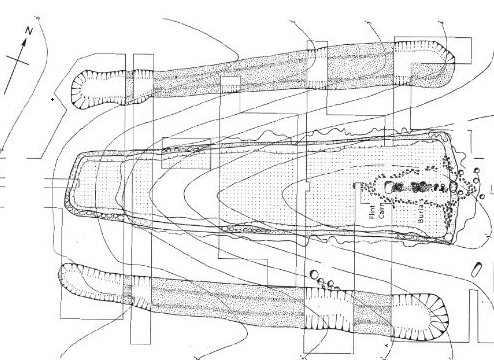 In the case of Fussell’s Lodge, the trapezoidal shape represented a bedding trench used to hold timbers which acted a s a revetment for the mound. 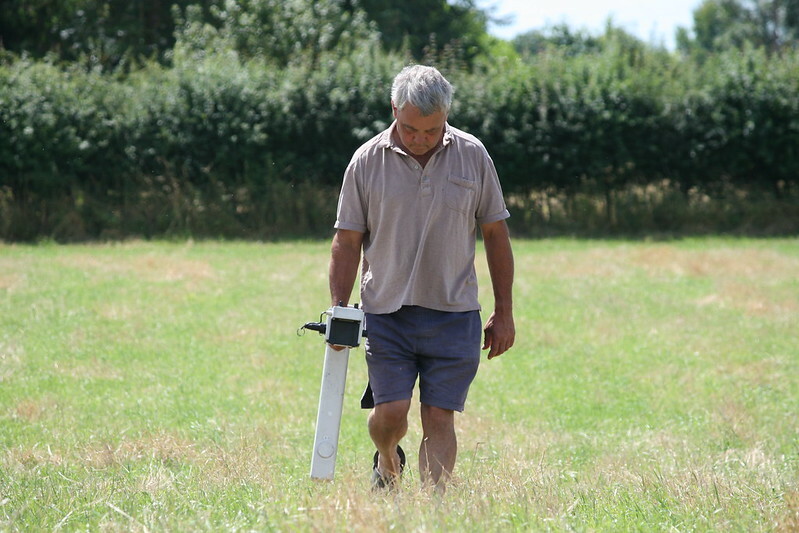 Our first venture out with the gradiometer had been a huge success. 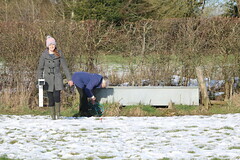 We now need to extend our survey area to pick up the full shape of the outer ditches. Many thanks to Bournemouth University for lending out their equipment, and to the New Forest NPA for hosting the equipment. See our the AVAS Flickr feed for more photos. 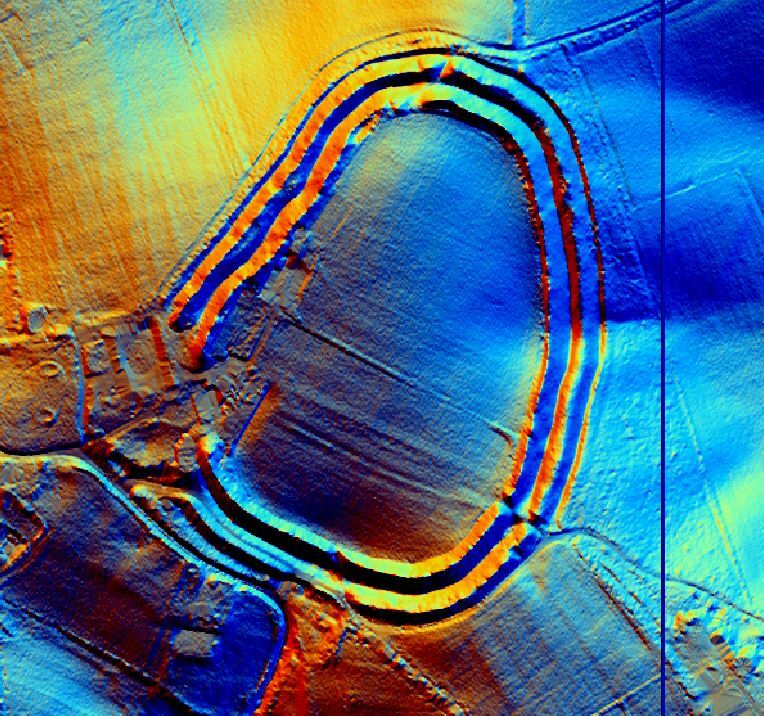 The announcement earlier this year that the Environment Agency was to make its Lidar data freely available was welcomed by archaeologists, who are able to use the detailed terrain height data to add a new dimension to existing aerial photographs, and provide a new source of data for studying archaeological features. This is of particular importance to amateur archaeologists, who are unable to afford the cost of commercially acquired Lidar data. The access to this data, in addition to the maturity of open source computer applications, means that such archaeologists can begin to make a real and effective contribution to the study of landscape features. For archaeological purposes, the DTM is probably most useful, as trees and bushes are stripped away to reveal any earthworks below. The downloaded zip includes a series text files with a .asc extension; these are text files which contain an array of height values for a specific small tile. Many Geographical Information System (GIS) software packages can read this data directly; I used the open source and freely available QGIS package. The most effective way of visualising Lidar data is with some sort of hillshade applied, which simulates the lighting of the landscape with sunlight from a particular direction and height. The problem with shading from just one direction is that linear features aligned with the direction of shading will not create a shadow. For archaeological applications, it is normal to create a composite of hillshades from a number of directions, using different colours to represent each hillshade. I used the excellent and freely available Relief Visualization Toolbox to create these hillshade composites. The picture above of Whitsbury Hillfort, near Fordingbridge in Hampshire, is an example of this type of rendering. A vertical exaggeration can be used to strengthen the depiction of subtle features. Once all of the hillshade images were created, I used a command line tool called GDAL to create a mosaic of all the images, called a VRT file. 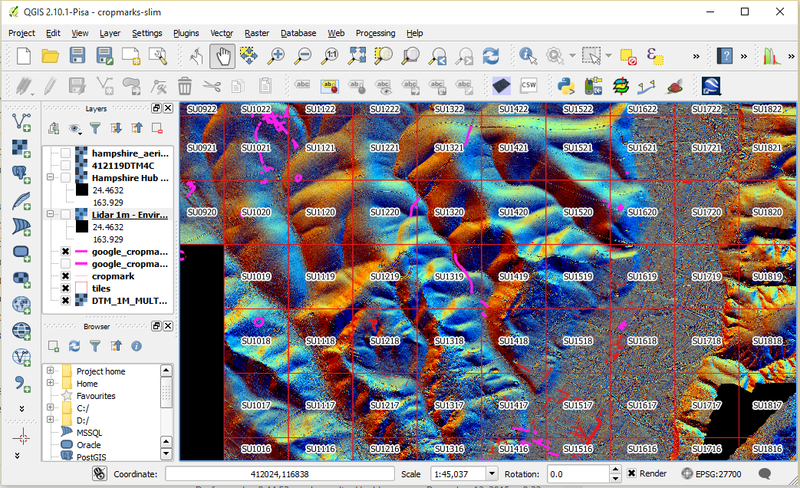 GDAL tools are available from the menus within QGIS. A screenshot is shown below [click on the image to enlarge]. It is worth noting that there is not a full national coverage of EA Lidar data; most river valleys and surrounding areas are available. The black areas in the screenshot above are locations where no data is available. So what have I seen so far during an initial browse of the data in the general region of the Avon Valley? I have picked out a few areas below. The screenshot of Whitsbury hillfort above shows the potential for depicting existing earthworks which are normally shrouded in thick vegetation. The detail shown in the ramparts can be compared to the original Royal Commission earthwork plan, and reveals subtle details not previously recognised. [Click on the image to enlarge]. This is perhaps my favourite area, showing a palimpsest of landscape features of true temporal depth. The end of the Neolithic Cursus can be seen in the centre of the image as a large subtle rectangular feature, which heads off towards the south west corner of the image. The much clearer long thin linear feature which points at the end of the cursus is a long barrow, as is the similar long barrow to the south. 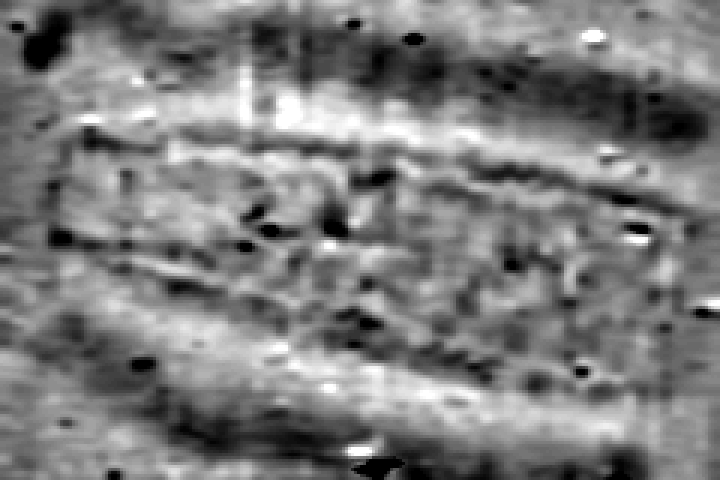 The former long barrow has long been suspected of being two adjoined long barrows, and this is borne out by the Lidar, which shows two sections on slightly different alignments. There is another ploughed out long barrow to the north of the cursus, which shows as an oval mound. The large bank and ditch which snakes from north west to south east is Bokerley Dyke, a linear boundary which probably had significance in the Bronze Age and Iron Age, and was most likely strengthened in the late Roman period. To the east of Bokerley Dyke, a series of probable Prehistoric field boundaries can be seen. Finally, the substantial rectangular earthwork in the top centre of the image brings us into the 20th Century, representing an army training range. [Click on the image to enlarge]. This image shows an extensive field system on and around Rockbourne Down. Most of the field boundaries are under plough, but the crisp boundaries to the east of the image are still under pasture and much better preserved. There also happen to be three long barrows on this image. 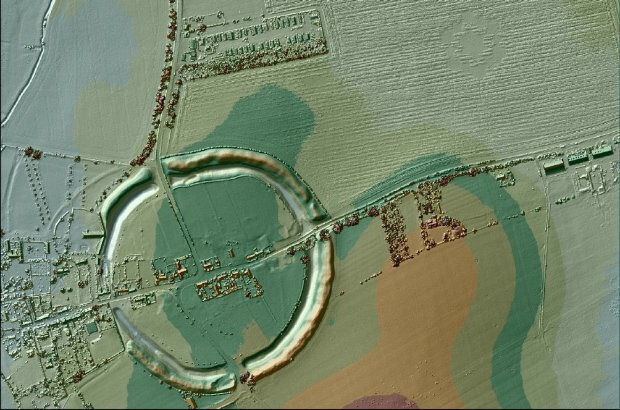 The one at the centre top is the huge and well preserved ‘Round Clump’, with the mound and ditches clearly depicted in the Lidar data. At the western side of the image is the ploughed out Rockbourne Down long barrow, pointing in a SSE direction. To the east of the image, crossed by the horizontal blue grid line is a much smaller long barrow mound. 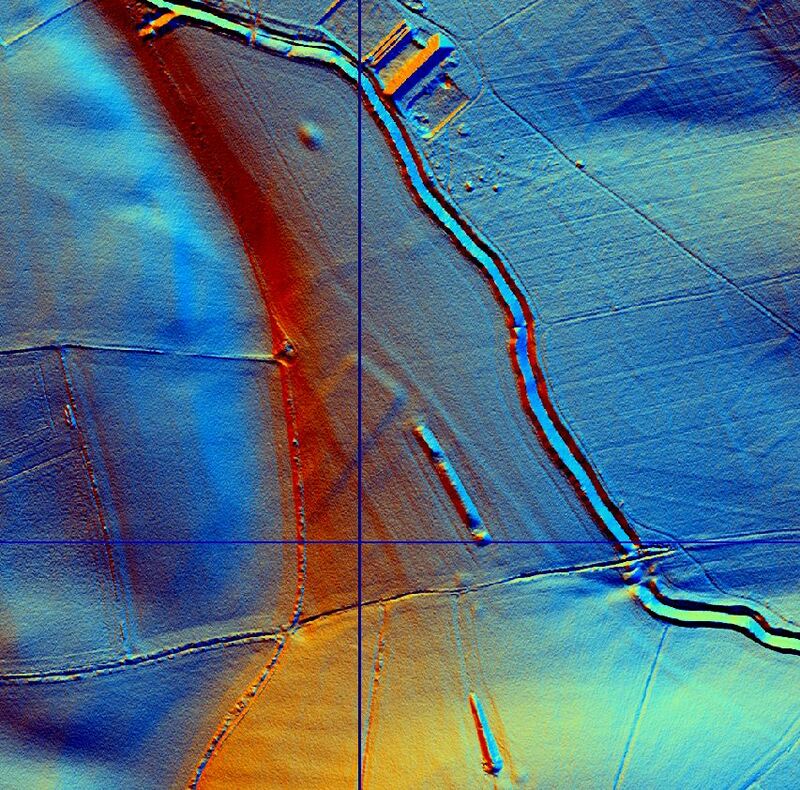 In summary, now that the Environment Agency Lidar data is now freely available, amateur archaeologists have at their disposal a rich new source of data to study past landscapes and discover new sites. The images above show the potential for this resource, which can be used to illuminate even the most subtle earthworks with an unprecedented clarity. 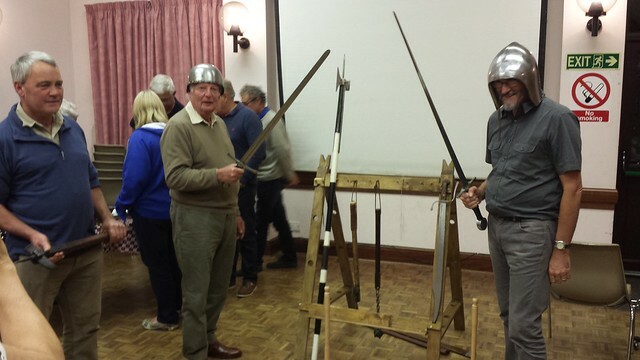 At the AVAS lecture for October, AVAS members were treated to a fascinating talk from Dave Fawcett, and expert in historic arms and armour. 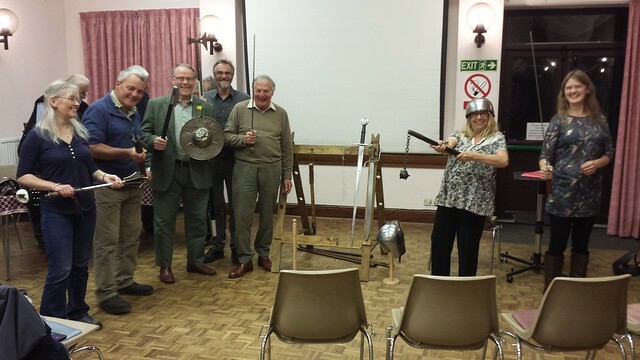 In the first part of the talk, Dave talked about the intricate jostling for power among members of the French and English royal families, and how this translated into a series of battles in the Hundred Years War, culminating in the famous Battle of Agincourt. 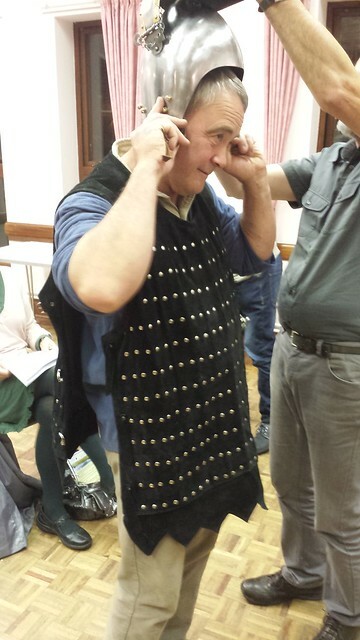 The second part of the talk concentrated on the arms and armour, and Dave had kindly brought along a number of replica examples which we we able to try out for real. 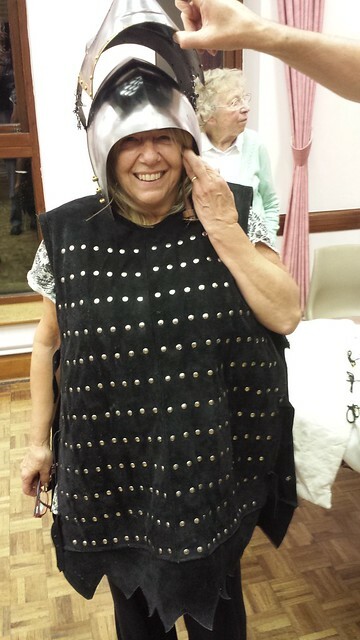 I have added a number of photos below, and should add that no AVAS members were harmed during playtime with the weapons. More photos are available on the AVAS Flickr photostream. The initial programme of talks in the AVAS 2015-16 lecture series has been announced on the meetings page on the main AVAS website. Some talks later in the year are still to be confirmed, but the first few lectures look really interesting, spanning the Palaeolithic to the Hundred Years War. Jane Ellis-Schön, Project Director of the Finding Pitt Rivers Project, will open the lecture series on 2nd September 2015. She will talk about cataloguing and researching the Pitt Rivers Wessex collection at Salisbury Museum. 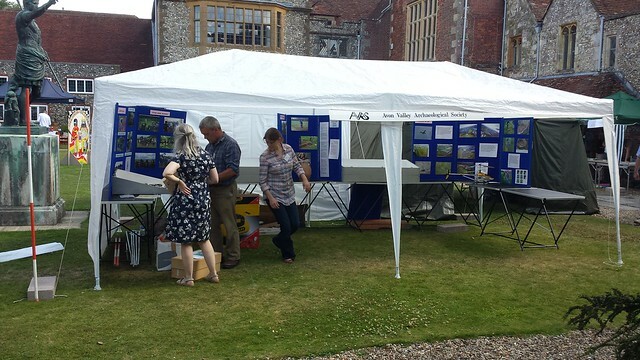 The timing of this talk is particularly apposite given the start of the Foundations of Archaeology project, which celebrates the work of the pioneering archaeologists who first identified the rich upland archaeology of south Wiltshire and north east Dorset. The latter project will be looking at two site excavated by Pitt Rivers: Wor Barrow and Winklebury Hill. Visitors are made very welcome at the AVAS lecture meetings, which are held in Ringwood on the first Wednesday of the month between September and May – see the meetings page on the main AVAS website for more details. From September 2015 all our LIDAR data will become Open Data and everyone will be able to use it for free. This is on https://environmentagency.blog.gov.uk/2015/06/16/free-mapping-data-will-elevate-flood-risk-knowledge/. The page states that 72% of England now has LIDAR coverage,and the chances are that the Avon Valley and surrounding areas will be available. This will be a fantastic resource for investigating the archaeology of our region. 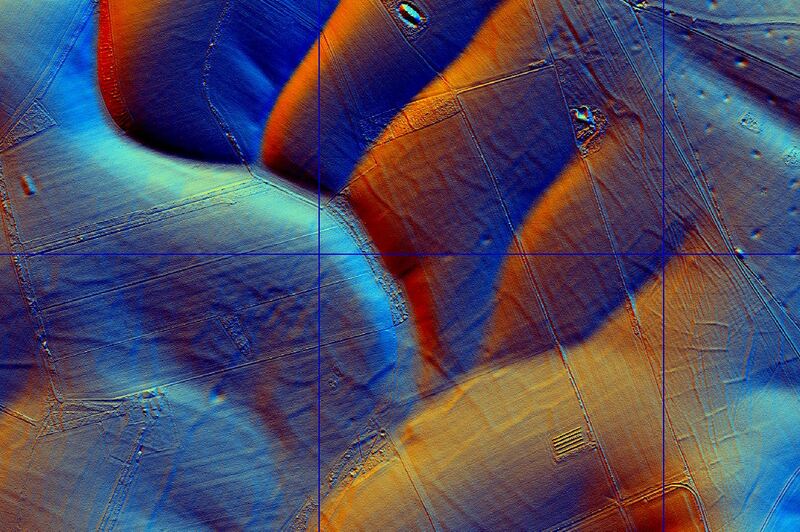 Recently the New Forest made available images of hill shaded LIDAR data, accessed via an index map. Although this is a very valuable set of data, it is difficult to integrate with other layers of data in a Geographical Information System (GIS), as it is not georeferenced. The Environment Agency data will be georeferenced, and has the advantage of being raw data, allowing greater control over how the data is displayed, including the ability to exaggerate the data to make subtle features stand out more clearly. I will post an update in September when I have downloaded some data. 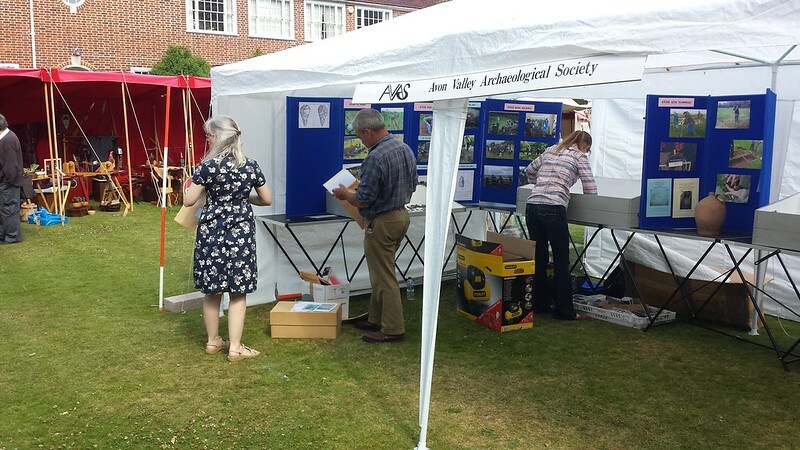 Following on from the previous post, AVAS had a second successful day last Sunday at the Festival of Archaeology at Salisbury Museum. 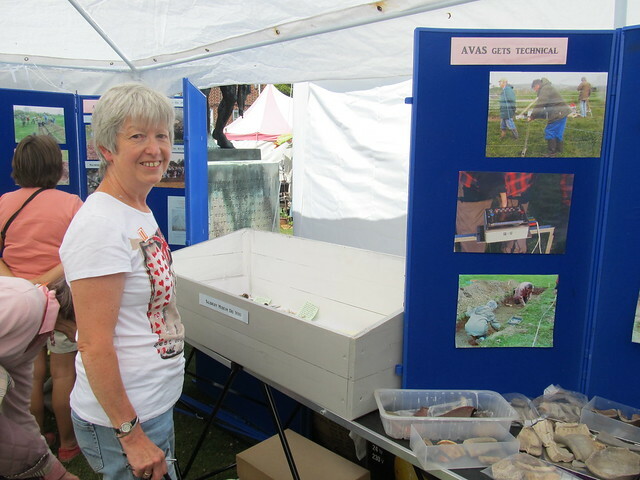 AVAS had a stand at the Salisbury Museum Festival of Archaeology today. A few of us were up bright and early this morning to set up. 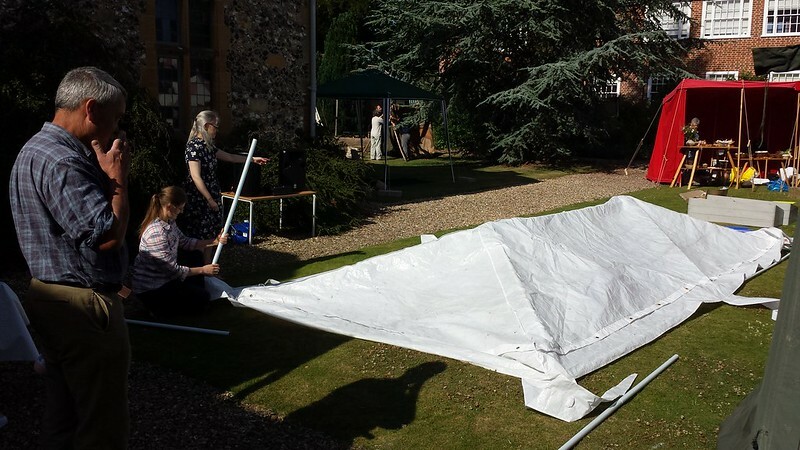 We had a few difficulties erecting the double gazebo after failing to locate the instructions. However, we were soon setting out a quality display of finds and photos. Our stand was sandwiched between a bunch of friendly Angle Saxons, and the crowd pulling Phil Harding of Time Team fame. 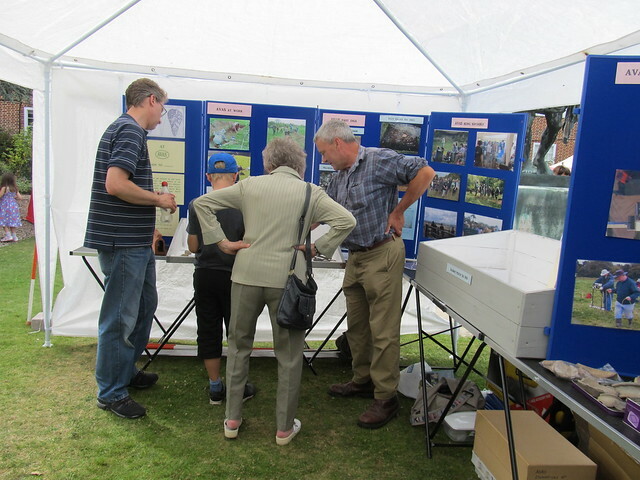 The event was really successful, and we had a steady stream of interested visitors to the stand. We will be attending once again tomorrow. There are a few more photos on the AVAS Flickr photostream. 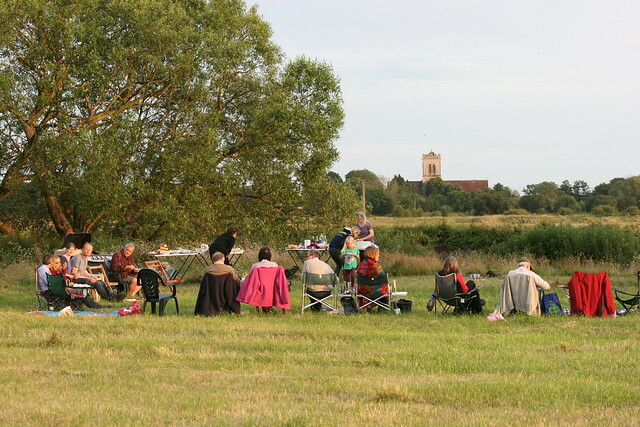 We had great weather on Saturday for the annual AVAS BBQ, once again hosted by Mark on the banks of the River Avon. The food was fantastic (thanks to Vanessa, Rachel and family for preparing an array of tasty treats). 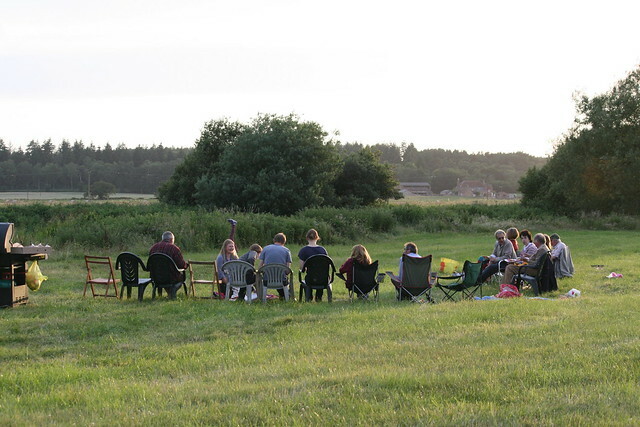 Thanks also to Mark for sorting out the barbeque and allowing us to use his farm as the venue. 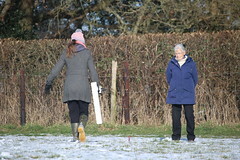 I have posted some more photos on the AVAS Flickr photostream. 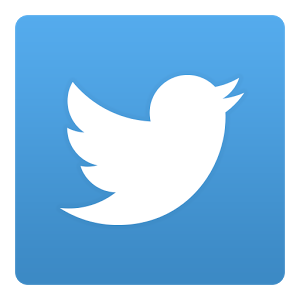 AVAS has finally succumbed to the power of social media, and now has a page on Facebook and an account on Twitter. If you are a user of Facebook, simply go to http://www.facebook.com/avonvalleyarchsoc and ‘Like’ the page to receive Facebook updates. AVAS members should let me (Mike) know if you wish to make posts on the page. Our WordPress blog is now linked to both accounts, and posts to the blog should also appear on Facebook and Twitter (I hope! ).